Recently, it was questioned whether UK manufacturers could be missing out on opportunities to save energy by overlooking the potential of their compressed air systems. When approached correctly, the process can be efficient, fast and hassle-free. These steps can be taken to ensure the efficiency of your compressed air systems! Read on to find out how. Compressed air energy audits can of course quickly flag-up no-obligation opportunities for improvements. Additionally, energy savings can either be implemented by themselves or they can work with their partners. This is particularly pertinent for companies seeking to implement an energy management system, whilst working towards achieving ISO 50001. Also, there is a strong case for companies that have to comply with Phase 2 of ESOS, which requires companies to conduct audits that identify cost-effective and energy-efficient solutions. As air compressors typically consume between 10-12% and even up to 30% of a factory’s electricity, the potential for finding energy savings through conducting compressed air audits should not be overlooked. Initially, the first step could not be any easier: it involves a visual assessment such as a free #airCHECK service which can be done in just 10 minutes. This also has little disruption to production. By this nature, this type of exercise is intended to flag-up ‘quick win’ opportunities for end-users to fix costly air leaks and address inefficient operating practices (such as leaving compressors running during down periods of low-demand, such as evenings and weekends). An #airCHECK service can be used to highlight whether a compressed air system is non-compliant or losing serious money. If you wish to investigate the potential savings in more depth, the next stage would be to perform a straightforward data-logging exercise such as an iiTrack system energy audit. This type of no-obligation service is typically non-intrusive, with the required hardware typically taking less than 15 minutes to install. After the setup process, the data logging device is left to operate for a one-week period, during which AIRchitect software intelligently analyses compressed air usage patterns. Following this process, participating companies will then receive a free and detailed report which outlines where improvements to their compressed air systems can be made. It also highlights solutions to reduce energy consumption and ISO standards your company is potentially non-conforming to. This is a highly valuable process due to the potential it can bring both in energy savings and finances. Health and safety is also vital – for example, incorrectly specified compressed air equipment, air leaks and poorly sized pipework with long runs, excessive bends and fittings can all pose a risk. Accordingly, responsible compressor systems manufacturers and suppliers should look to identify these potential hazards during the audit process. They should also provide recommendations on how to address these risks. This audit-led approach is backed up by a number of real-world case studies. There are cases of large companies benefitting from such an audit, as it has both improved energy efficiency and saved them money. 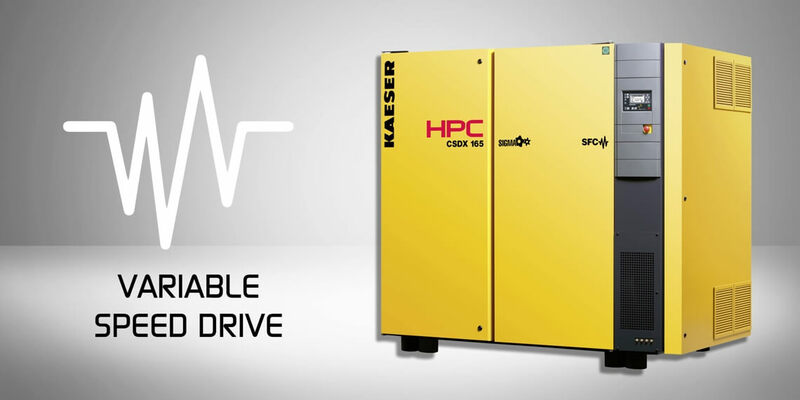 Despite such savings being widely achievable through the latest advances in VSD compressed air technology, some companies continue to be put off by the perception that the installation stage disrupts day-to-day operations. In fact, when handled by a reputable OEM, the process is meticulously planned o have as little interruption as possible. For instance, the installers will utilise existing back up compressors or the ones being replaced to ensure there is no loss of production. However, simply installing the compressor is not enough. Responsible OEMs and distributors should offer around-the-clock support in the weeks immediately following installation. This ensures everything runs smoothly, and the encourages the end-user to adopt a service contract that will ensure they have peace of mind throughout the total lifecycle of their system. For manufacturers looking to go one step further and continually optimise their compressed air system, it is highly advisable to utilise the latest advances in remote data monitoring technology. A solution like this is called SmartLink, which enables air compressors to be compatible with Smart IoT oriented factory environments. Once it has been activated, the intelligent software in the SmartLink data monitoring programme performs real-time analysis of compressed air usage patterns and (depending on the option chosen), will provide proactive warnings of potential failures and flag-up opportunities to improve uptime. What all of this shows is that by making even the smallest of changes can result in financial and energy-saving improvements. It also highlights opportunities to implement the best practice in terms of health and safety. Established in 1994, Telford Compressed Air Services Ltd. specialise in the design, supply, installation, repair and maintenance of quality compressed air systems. In addition to this, our ‘DRY AIR HIRE’ service provides compressed air users access to our extensive fleet of hire equipment in emergency situations as well as offering a unique budgeting solution for long-term hire agreements. To find out more about our compressed air services, visit our website at https://www.tcascompressors.co.uk/, email us at sales@tcasltd.co.uk or alternatively you can call us on 01952 292121.